Arcangelo Corelli (February 17, 1653 – January 8, 1713) was an influential Italian violinist and composer of Baroque music who was known as an educator who brought together the basic elements of violin techniques and performance skills. He is also known as the creator of the concerto grosso which was a popular form that pitted small and large ensembles within a string composition for the diversity of sound and texture. This joint instrumental action and reaction was a technique that Corelli successfully used to demonstrate conflict resolution within a musical composition. Corelli worked towards peaceful give and take with his string students to inculcate a principle which was very similar to living for the sake of others. Arcangelo Corelli was born at Fusignano, in the current-day province of Ravenna. Little is known about his early life. His master on the violin was Bassani. Matteo Simonelli, the well-known singer of the pope’s chapel, taught him composition. However, Corelli used only a limited portion of his instrument's capabilities. This may be seen from his writings; the parts for violin never proceed above D on the highest string, the highest note in the third position; it is reputed of Corelli's refusal to play a passage which extended to A in altissimo in the overture to Handel’s oratorio Trionfo del Tempo (premiered in Rome, 1708), and took serious offence when the composer played the note. Nevertheless, his compositions for the instrument mark an epoch in the history of chamber music; his influence was not confined to his own country. Even Johann Sebastian Bach is reputed to have deferred to him, and he is considered one of Antonio Vivaldi's greatest influences. Musical society in Rome owed much to Corelli. He was received in the highest circles of the aristocracy, and for a long time presided at the celebrated Monday concerts in the palace of Cardinal Ottoboni. 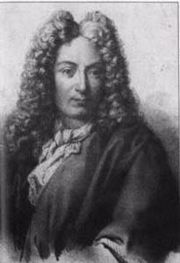 Corelli died in possession of a fortune of 120,000 marks and a valuable collection of pictures, the only luxury in which he had indulged. He left both to his benefactor and friend, who generously made over the money to Corelli's relations. Corelli is buried in the Pantheon at Rome. You can still trace back many generations from student to teacher from Corelli. His compositions are distinguished by a beautiful flow of melody and by a mannerly treatment of the accompanying parts, which he is justly said to have liberated from the strict rules of counterpoint. Six collections of concerti, sonatas and minor pieces for violin, with accompaniment of other instruments, besides several concerted pieces for strings, are authentically ascribed to Corelli. The most important of these is the XII Suonati a violino e violone o cimbalo (Rome, 1700). Corelli is also noted for the Twelve Concerti Grossi, opus 6, which is arguably one of his most famous works. These concerti have often been popular in Western culture. For example, a portion of one of Corelli's twelve Concerti Grossi, Opus 6 (Concerto 8 (The Christmas Concerto), 3rd movement) is in the soundtrack of the film Master and Commander: The Far Side of the World. He is also referred to frequently in the novel Captain Corelli's Mandolin. Free scores by Arcangelo Corelli in the Werner Icking Music Archive. Retrieved September 25, 2007. Easybyte - free easy piano arrangement of "Adagio / Concerto Grosso Opus 6, #8" plus midi sound file. Retrieved September 25, 2007. Sheet music by Corelli, A available at Mutopia. Retrieved September 25, 2007. This page was last modified on 22 November 2016, at 21:14.